Aqua-Tech and Lochinvar® Releases NOBLE™ Fire Tube Combi Boiler in Canada | Aqua-Tech Sales and Marketing Inc.
Aqua-Tech Sales and Marketing Inc. and Lochinvar, LLC release the NOBLE™ Fire Tube Combi Boiler for residential applications in Canada. 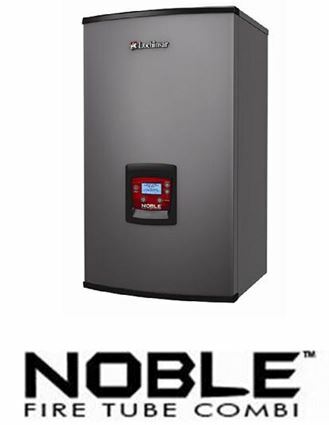 With three models ranging from 110,000 to 199,999 Btu/hr., the Noble boiler offers easy installation and serviceability, true instantaneous response time and a user-friendly interface. In addition to 10:1 turndown and 95 percent Annual Fuel Utilization Efficiency (AFUE), the Noble Fire Tube Combi Boiler is designed, engineered and assembled in the USA. The Noble boiler is equipped with Lochinvar’s SMART CONTROL™ and features an intuitive setup wizard to guide contractors through programming parameters quickly and easily. The backlit, user-friendly LCD display provides diagnostic information and system status in plain English, not codes. The Noble boiler’s patented control technology, featuring pre-heat and domestic hot water response modes enable this combi to deliver hot water almost instantaneously during frequent use cycles, like washing dishes. For space heating the Noble boiler’s Air Handler Interlock provides comfort and energy savings. By switching from space heating to domestic hot water mode, it immediately stops non-heated air from circulating so homeowners stay comfortable. Critical components such as the built-in circulator are easily accessible making service and maintenance for quick and easy for contractors. “The Noble boiler was built with the contractor in mind. The SMART CONTROL makes it quick and easy to set up, and all components are easily located within the boiler. We feel this fire tube combi boiler will be an easy choice for contractors with the end result creating very satisfied customers.” said Dan Rettig, boiler product manager for Lochinvar. For more information on the Lochinvar Noble Combi Boiler contact your local stocking distributor.